The Note series is obviously the most loved Smartphone series of Samsung after Galaxy S series . 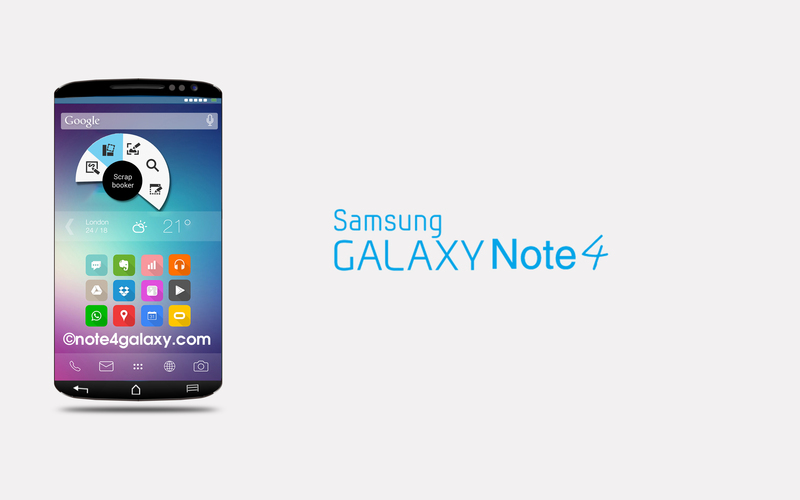 Note 4 has number of Trademark features which makes Samsung the best in the Note-Type Smartphones. The Note 4 is expected to have Exymos Octa-Core Processor with Mali720 T graphics engine . And the LTE version of Note 4 is going to have Snapdragon 805 chipset series and Adreno 420 graphics . You must have heard about the nano-class RAM set which Samsung had unveiled last year. If you haven’t heard then let me say that simply its a different type of RAM which performs 50 % better than all normal RAMs and the rate of Data Processing is double . The processing power is expected to be very fast than other Samung Smartphones . People say that Android eats up more RAM and needs more RAM to perform better than Lumia Smartphones or iOS phones . But according to analysis by some experts say that Windows & iOS having low RAM still performs fast , but they don’t support features like Multi-Window and other features which only Android phones have . The outside features in Windows and iOS Smartphones is less compared to Android Smartphones so Samsung thought of implementing the advanced RAM which will perform fast too so that user’s won’t be dissapointed with minor lags in High-End Smartphones. It may contain a 16 MP Sony Camera which can record UHD resolution videos at 30 fps & a front camera of 3.1 MP . These were about the specs , and expectations which may prove accurate after the launch in Germany . Do you know what’s more interesting in Note 4 ? ?……………Guess ? ? The one and only S pen ! The S pen just get’s better and better after each Note series evolution , Samsung has teased several videos about the usefulness of the new S Pen features which no innovative company can do or would have thought to do .